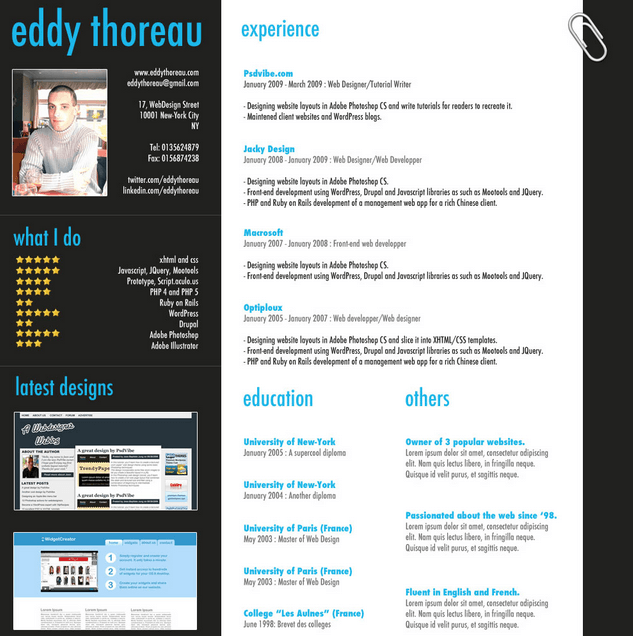 I’d like to show you today a classic professional resume template which can be used, with little time spent on it, by everyone. This practical example below is focused on web designers, artists, photographs and other professions, where you would like to present a little bit of your portfolio. But because this resume template is created in Photoshop (.psd) format, you can do, what ever suits you and your profile best 🙂 . It is really easy manageable and to work with. In this resume template, you can cover all the necessary areas as are experience, education, your skill set, contact details and of course, above mentioned (part of your) portfolio. There is also extra section for “other” type information, where you can fit whatever you’d like to like your achievements etc. Place for contact details is also present and on the top of the template, you can place your profile picture.